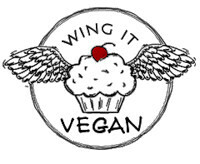 Wing It Vegan: A Few Peanuts a Day Make the Squirrels Go YAY! 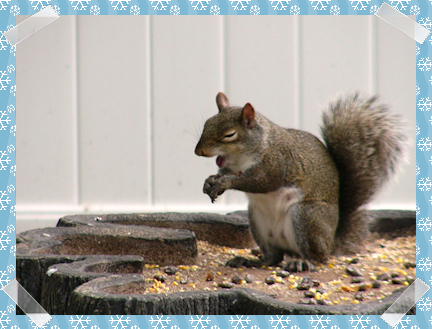 A Few Peanuts a Day Make the Squirrels Go YAY! Brrr!! Gone away is the bluebird, here to stay is a new bird! Or in this case, here to stay is the squirrel. Poor cold squirrels! 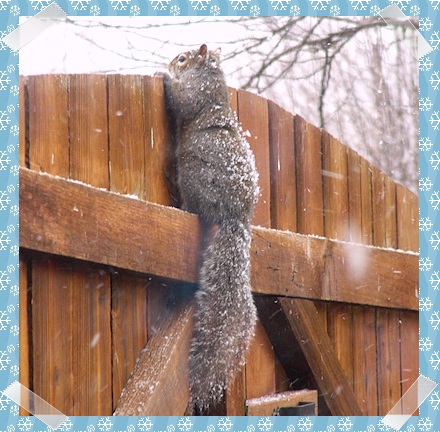 This post is about keeping their fuzzy little tails warm and happy during the winter wonderland months. The best way to keep them warm? 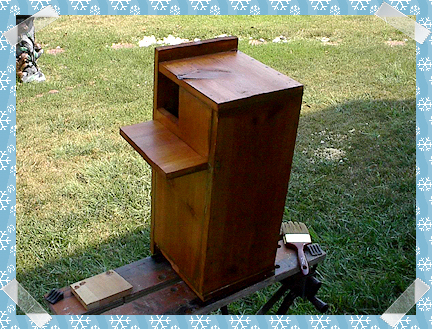 Build them a nesting box! 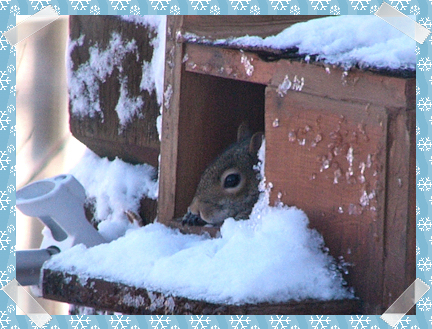 Mr. Wing-It and I built this squirrel house a few years ago, and we must have done a good job because one of our backyard squirrels approved of it and moved in for the winter. She actually had her babies in there! No baby pictures though, I don't think Momma Squirrel would have been OK with that. I think these were the plans that we used, but we decided to wing it and cut out an entrance square, instead of a round entrance hole. You can find other plans if you do a quick google search, like this one or this one. They are all basically the same concept, but with a few different features here and there. If you're not feeling crafty or you're not confident enough to build a safe nesting box, there are some available for sale that will save you a lot of work and trouble. Here's one, and here's another one. There are a few different ones here, and check out this site where you can buy squirrel houses made out of recycled tires. Awesome! If you don't own your home, you might want to check with your landlord, or parents, or roommate, or innkeeper, or jail guard before you put up a squirrel house. Some people can be rather paranoid about squirrels. OK, that's enough chatter. We all know we're here for the cute squirrely pictures! Momma Squirrel, warm and sleepy in her nesting box. Aww! So? Is it greener on the other side? Another way to keep them happy is to put a handful of peanuts out for them every day. Mr. Wing-It gives the birds and the squirrels a big serving of seeds and peanuts every single day. 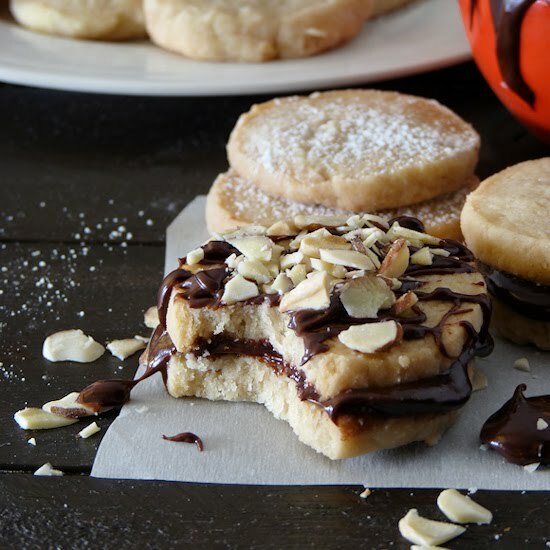 They like to hide their peanutty treasures under fallen leaves and save them for later. like Homer Simpson squirrel here. "You might, m'lady, tweak my nose.You could, m'lord, step on my toes. 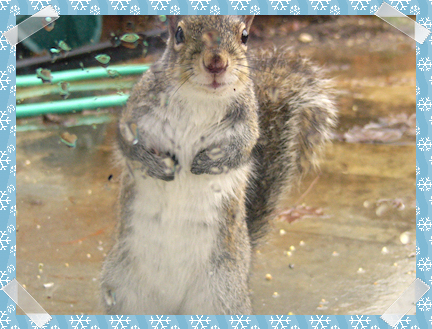 But Heaven help those poor bozos, who try to filch my Newman-O's"
Neighborhood birds and squirrels can have a hard time finding water in winter when everything is frozen, so a bird bath or any kind of water is always welcome. Mr. Wing-It gives them fresh water every morning. I love this unintentionally awesome photo! Squirrels are very well mannered creatures and they always want to give something back to show their appreciation for their shelter, food, and water. Their favorite method of payment is buffoonery! Nap time by the kitchen window! They subtly let us know when they've had enough of our picture-taking. I've known people who were, as you say, paranoid about squirrels (not in a good way), but I had no idea there were people who built them abodes and encouraged their comfort. Cool. Thank you for this spectacular post!! All of the squirrely goodness really cheered me up today! 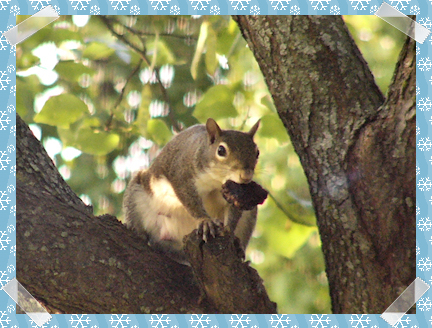 You and Mr. Kook are so sweet to help out the birds and squirrels! The closest we get to squirrels is docos and photos. We don't get em here. Thanks for posting the pics! 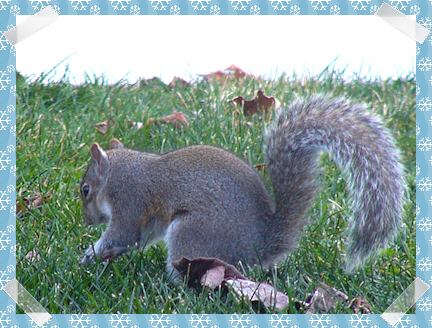 I ♥ the squirrels! Awww! The pictures you take are awesome, they really seem to capture the character and personality of the squirrels! 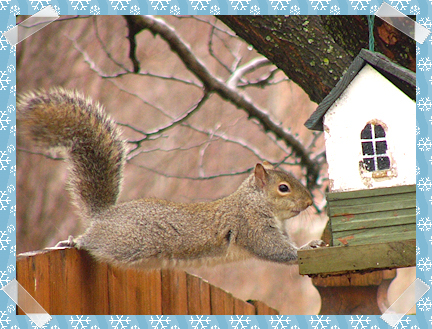 Is it wrong that Peeping Tom Squirrel reminds me of the Squirrel Underpants Model? LOL! Andrea - If we were filthy rich, we would spoil every possible backyard creature in every possible way! Lately I've been wanting an open dovecot for the little guys. They seem so cold out there! 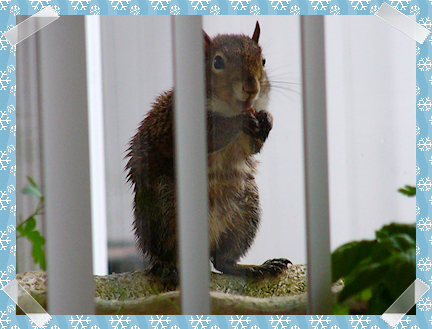 Tara - I'm glad the squirrels cheered you up! They do have a natural talent for doing that! Ohhhhhh my goodness!!!!! My roommates just checked to make sure I was ok, the squeeing was getting out of control. I love that you guys made a squirrel nesting box, and then those photos?! Amazing! 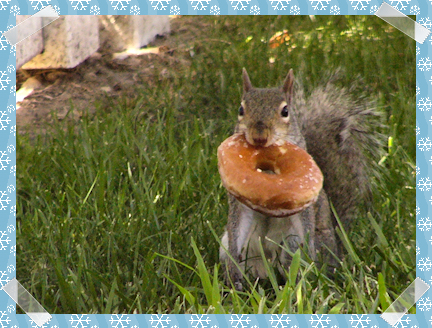 That one of the squirrel with the donut is way too cute for words. You rock! Those are by far the cutest squirrel images I have ever seen--photos or live! I have to admit that I've never been a fan of squirrels (the ones here in Queens Park are pretty aggressive), but these look positively lovable!! 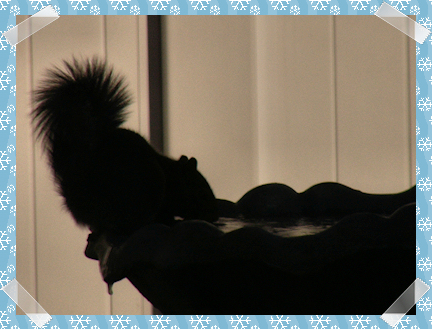 awwwwwwwwwwwww - all the squirrels are so adorable, River! 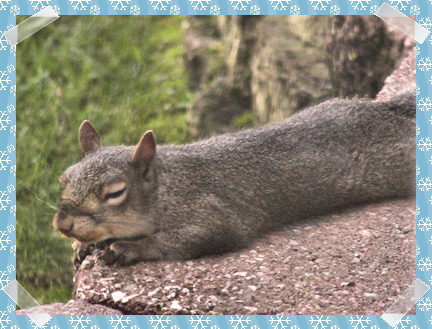 you take such beautiful photos, i just love them all (especially the sleeping squirrel!)! i've never thought to build a little shelter for a squirrel. it sounds like fun & something i'd love to make, too. thanks for the idea, my friend. you are too awesome! Everything about this post is so awesome! 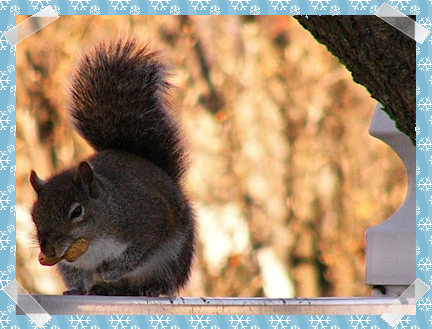 Thanks for caring about the local squirrels, for building a sweet squirrel house, for the peanuts, and for sharing these fantastic (and often hilarious) pictures! 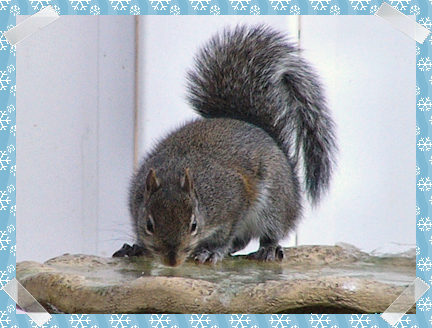 I love squirrels too, but you've seriously raised the bar :) Great post!! oh my god - overload of cuteness!!! momma squirrel's adorable. we used to have a squirrel that lived in our back garden when i lived at home. he was a fat bugger and he was always inching closer and closer to our door. i think he would have come in if mum hadn't scared him away. which bugged me - he was my friend. i named him timmy. oh god that story made me sound special, and not in a good way! Ricki - I'm so sorry you're stuck with aggressive squirrels! It sounds like they could use some manners-lessons from our friendly ones! Jessy - Thank you! I just point and shoot, the squirrels are the ones that strike the awesome poses! I hope you have fun building a nesting box!! Squirrels! I love squirrels. They are so cute. I get so excited whenever I see one. Which is never actually at home since we do not have squirrels here in Australia. But when I went to England I would practically squee in delight every time a little squirrel friend would strike a pose! But back in Australia I have to live a vicarious squirrel life through other people. You are the Jane of all trades!! The strawberry hats are gorg! If only we lived closer....le sigh. I usually don't like squirrels because I've only ever met the kind that barked at my dogs and threw acorns and/or pecans at my head. But this...is just so freaking adorable!!! I absolutely LOVE this post. Sooooooooo cute. Mo - Mean squirrels! 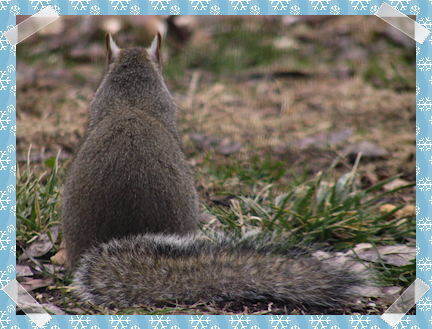 Our squirrels are so well behaved that they make your squirrels sound even worse in comparison! Bad, bad squirrels! How did I miss this post?? 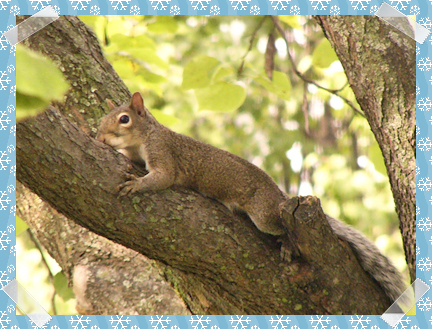 Squirrelly is so pleased that you blogged about squirrels! She really can't thank you enough for building that amazing squirrel condo for her cousins. She has one too but she likes yours better!